As promised, here is my first head-to-head beer review. This was originally going to be my first Gourmandatory article, and I am posting it here more as a preview of the format. I realize that I have already reviewed both of these beers individually on Hoppy Boston, but I still thought this was worth posting. In the future I will probably have less general information on the style, this was initially aimed towards a more general crowd, while many of the readers of this blog are connoisseurs. Enjoy, and let me know what you think! The Competitors: My first head-to-head beer review involves two local takes on the Belgian saison style, Allagash Saison versus Trillium Farmhouse Ale. The saison style started in farmhouses in Belgium and France where the beer was brewed for the farm workers. The lack of a single origin resulted in a huge variation of flavor profiles that all fit under the saison umbrella. A wide variety of malts, specialty grains and hops can be used in the brewing process. The one consistent feature is the Belgian style yeast, which adds subtle spicy and fruity flavors to the beer. I think this lack of style-related constraints is one of the main reasons American craft brewers have embraced the saison style. Some American saisons have been brewed with the addition of dark malts, an array of spices and adjuncts, or large amounts of American hops. When done correctly the citrus and tropical fruit flavors of American hops perfectly complement the fruity flavors derived from the yeast. Allagash Brewing Company was one of the first US breweries to focus on producing Belgian style ales. 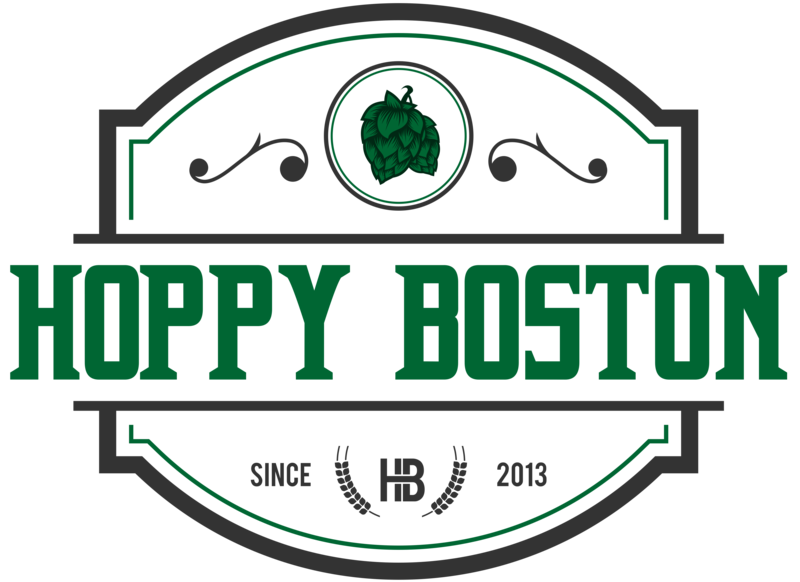 Located in Portland, Maine, their current lineup includes a series of Belgian and Abbey style beers along with limited edition barrel aged brews. This year Allagash introduced their saison as the first new addition to their year-round lineup in years. 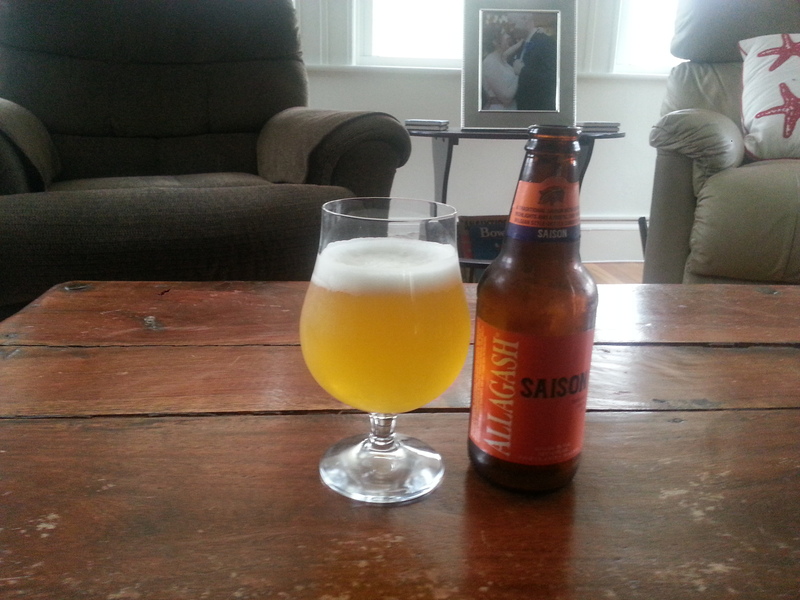 Allagash Saison is a very traditional take on the style. It pours a very light yellow and the smell is dominated by the fruity and spicy esters produced by their expressive Belgian style ale yeast. The yeast is also at the forefront of the flavor, notes of apricot, apple and pepper. You get a little malt and enough hops to balance the beer out, but this isn’t a hoppy beer. Allagash Saison is light and easy to drink, the perfect beer for a warm summer evening. If you like the flavor of European saisons I highly recommend this beer, it holds up against any traditional saison I’ve tasted. While Allagash is one of the old guard New England breweries, Trillium is an upstart, brewing small batches of beer in the Fort Point neighborhood of Boston since 2013. They have quickly gained a devout following. When Trillium releases a limited edition beer you can expect a line around the block at the brewery. Trillium’s flagship beer is their eponymous Farmhouse Ale. 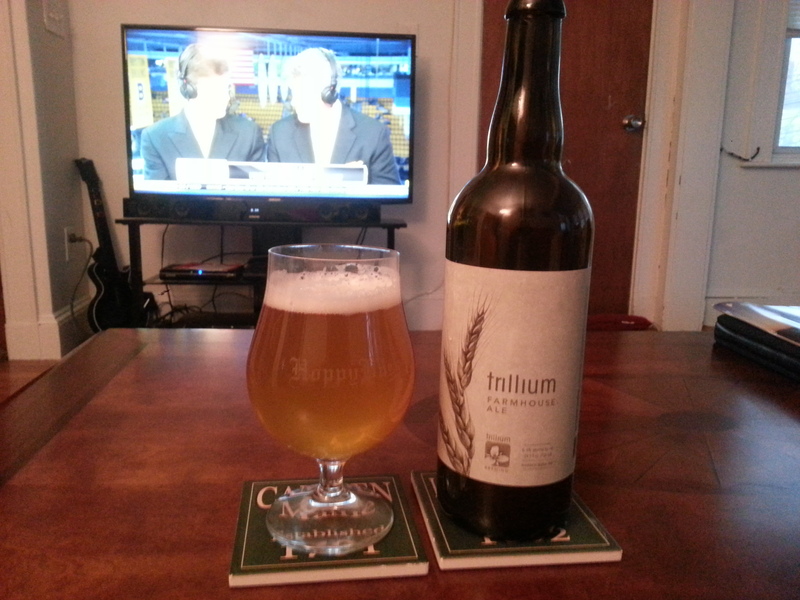 Trillium Farmhouse Ale pours a pale gold, slightly darker than the Allagash Saison. The smell also contains the spice and fruit of Belgian yeast, but in this case it’s mixed with a solid burst of floral American hops. The hops are also present in the taste, with pine and earthy flavors mingling with the pear and peppercorn from the yeast to give a complex but delicious flavor profile. Trillium Farmhouse is also very drinkable, light enough for a hot summer day, but substantial enough to drink year round. The Verdict: I picked two of my favorite saisons for the first head-to-head beer review, which doesn’t make it easy to name a favorite. These beers are very different takes on the style, but both are exceptional and highly recommended. While Allagash is a nearly perfect example of a classic Belgian saison, I love the use of hops in the Trillium Farmhouse, as they add an extra level of complexity to the flavor. Based on this I’ll give Trillium Farmhouse Ale the slightest of edges in this head-to-head beer review.